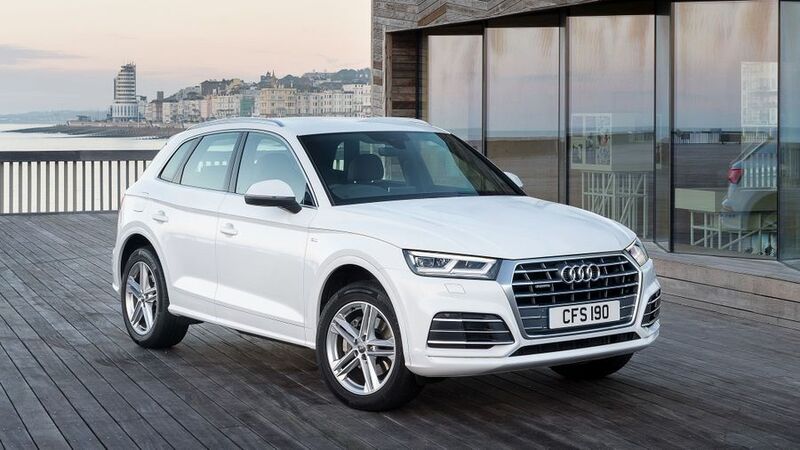 The Audi Q5 is a prestige compact SUV that competes with cars like the BMW X3, Jaguar F-Pace, Porsche Macan and Mercedes GLC. Like most other Audi models, it competes mainly on its interior quality and its technology. 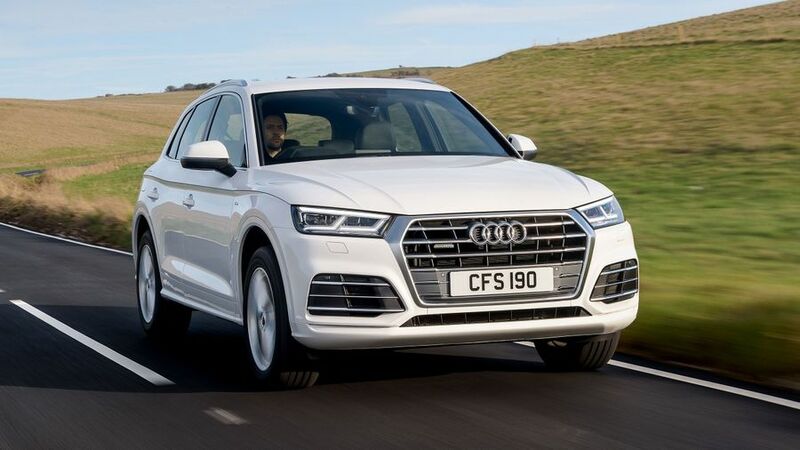 The Audi Q5 has no shortage of premium SUV competition, with Mercedes, Jaguar, Porsche and BMW all offering super-talented rivals. However, the Q5 definitely has what it takes to compete doing a great job in most areas, and an exceptional job in some of them. Not the most exciting car of its type, but certainly one of the most complete. As with any Audi, desirability will be a big part of the Q5’s appeal, and that’s something that it has in spades. 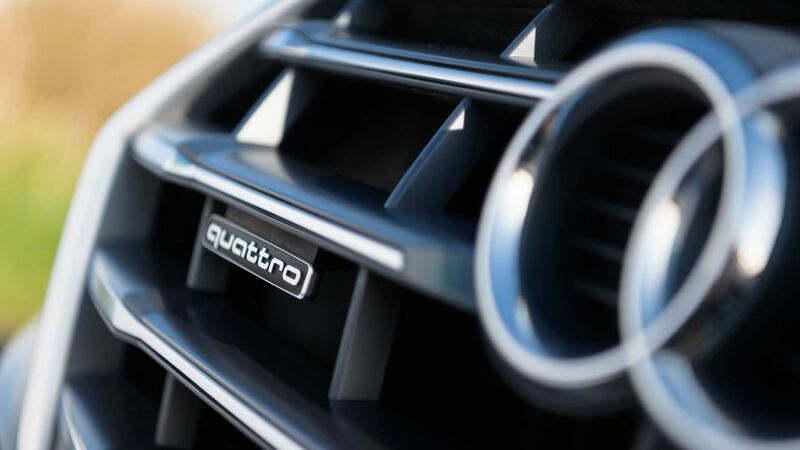 It comes not only from the four-ringed badges that sit at either end, but also from looks that are pretty hard to distinguish from those of the bigger, more expensive Q7. Entry-level SE models look suitably arresting, but Sport and S line models have even more sporty styling goodies to make them look even meaner. Most models have Xenon headlights with LED running lights and tail lights as standard, while top-end S line variants get full LED headlights. SE and Sport models ride on 18-inch alloy wheels, while the S line cars are upgraded to 19-inchers and also get a roof spoiler. White or black paint is standard, with other colours a cost extra. As always with an Audi, things get more desirable when you open the door and climb inside. The materials and cabin design are taken almost wholesale from the latest A4, meaning the materials are dense and sophisticated, and everything is finished with flawless precision and attention to detail. The infotainment system is displayed on a seven-inch centre screen (upgradable to an 8.3-inch screen if you opt for the Technology Pack). 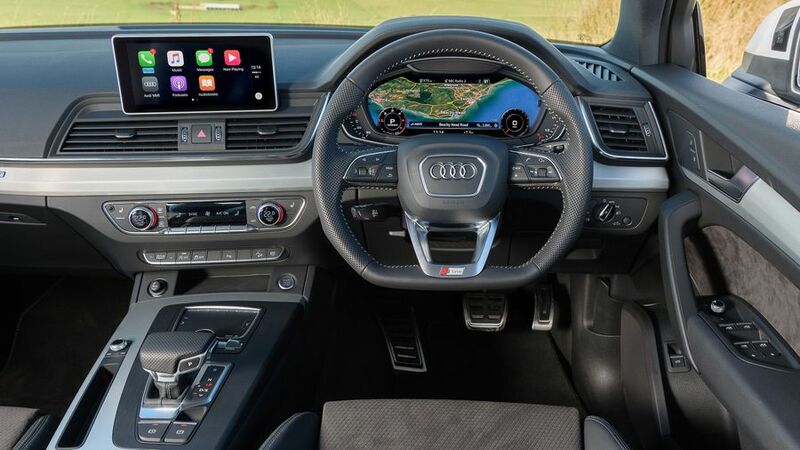 It’s controlled by a central dial and is mostly intuitive and easy to use, but if you specify Audi’s optional Virtual Cockpit system – that replaces conventional instruments with a large screen that takes care of both your driving information and your infotainment functions – then things take rather more getting used to. Once you do, it’s a clever feature, but it’s also an expensive option. All models have plenty of adjustment for the driving position, which is suitably commanding, and you get a clear view out in all directions. This wasn’t a particular area of strength for the previous Q5, but the latest one does a rather better job. That’s mainly down to the car’s longer wheelbase, which affords rear-seat passengers more generous legroom and there’s plenty of headroom for all three as well. A sliding rear bench allows you to shift the space available into the boot rather than the passenger compartment, so it can be used for legs or luggage as needed. Even at its smallest, the boot can hold 550 litres of stuff, and the sliding seat can boost this to 610 litres without dropping any chairs. This compares well to the Volvo XC60 and Lexus NX, but some rivals like the Jaguar F-Pace and the relatively cavernous Land Rover Discovery Sport have more luggage room. If you do lower the second row of seats, you get an impressive 1550 litres of space, but the load bay isn’t completely flat as the folded seats lie at an angle. There’s an adequate amount of cubby holes and cupholders dotted around the cabin, too, so all in all, the Q5 isn’t the most practical car of its type, but it’s still very competitive. Like with most Audis, the suspension you get depends on which grade of car you choose, and there are other optional arrangements are available on top of that. The SE model comes with Comfort Dynamic suspension, which we’ve yet to try, while Sport comes with the aptly-named Sport suspension. It’s impressive; stiff enough to keep things admirably level even when cornering harder than most customers will want to try, but still comfortable enough to satisfy most families. The S line comes with stiffer, sportier suspension that is really too much for UK roads and doesn’t take enough sting out of lumps and bumps. Sure, it improves cornering ability even further, but the pay-off isn’t worth it, and the Q5 isn’t a machine to drive hard anyway. Thankfully, you can spec the S line with the more relaxed Sport suspension at no extra cost, and that’s the route we’d take. Another option is to pay for the air suspension, which is pricey, but excellent. Importantly for a car that’ll be used primarily as family transport, it delivers a lovely smooth ride that wafts you along luxuriously when you select the car’s Comfort setting. Shift the setting to Dynamic, and you’ll enjoy crisp body control that contributes to impressively sharp handling. No suspension set up will let the Q5 compete with the likes of a Porsche Macan or Jaguar F-Pace for fun or involvement, though. The steering, although it’s weighty and consistent, doesn’t have the same level of engagement. That said, there’s no doubting how competent the Q5 is through a set of bends. 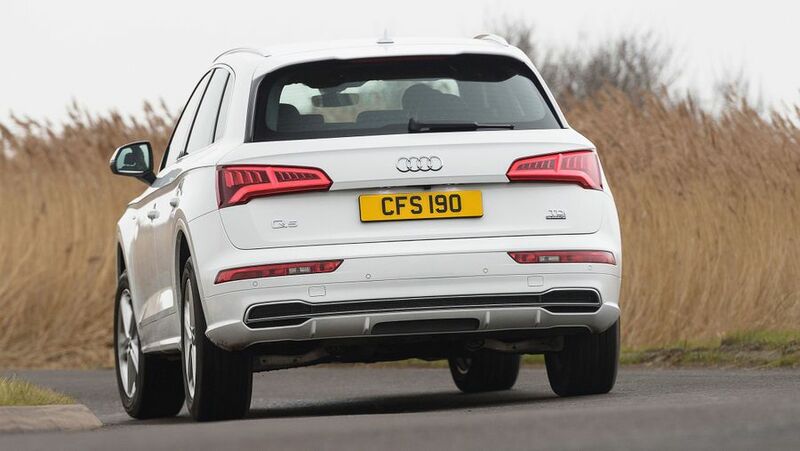 Although most versions have abandoned permanent four-wheel drive – standard on all previous Q5s – for an on-demand system that disengages drive to the rear axle under normal driving conditions to save fuel, you’ll struggle to detect the difference in the traction delivered. That’s true both on the tarmac and on looser surfaces. You can choose between a couple of turbocharged 2.0-litre four-cylinder engines – a petrol with 248bhp and a diesel with 187bhp – both of which come with a seven-speed twin-clutch gearbox as standard. The vast majority of UK buyers will plump for the diesel, so it’s just as well that it’s a very pleasant motor with a swell of power when it’s needed. Work it hard and it’ll make more noise and feel a bit wheezy, but for normal, everyday use it’s absolutely fine. The petrol is pretty good, too, with a generous slice of easy-to-access torque for nice easy progress, even if it doesn’t feel as brutishly quick as the power output suggests. It is, however, very smooth and quiet, which contributes to the car’s very impressive level of rolling refinement. We’ve also tried the 282bhp V6 diesel, which comes as standard with an eight-speed automatic gearbox and permanent four-wheel drive, and it delivers strong, smooth acceleration and excellent refinement. In addition, a petrol V6-powered SQ5, with 349bhp, will arrive later. 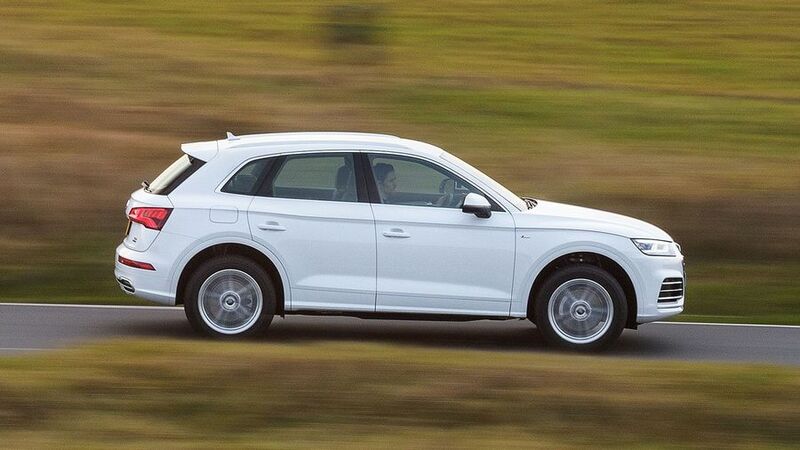 The Q5 is priced competitively against its rivals. It’s not the cheapest premium SUV around, but it still undercuts the likes of the Range Rover Velar by some way. It’s broadly similar in cost to the Jaguar F-Pace and Volvo XC60, but with cars like these, pricing isn’t normally a deal-breaker: you don’t pick the cheapest one, you pick the one you want. Fuel economy is very competitive on all the engines, helped by Audi’s move to on-demand - rather than permanent - four-wheel drive, and CO2 outputs are competitive, too. Audi residual values are traditionally strong, which helps considerably with whole-life costs. The Q5 scored a maximum five stars in the EuroNCAP crash test and includes a good selection of safety systems as standard. Plenty of airbags, two Isofix and top tether child seat attachments in the back and an active bonnet to help protect pedestrians are all in every car, as is automatic emergency braking to stop inadvertent rear-ending of other cars. More kit is available on the options list, including rear side airbags, hill hold assist, traffic sign recognition and adaptive cruise control. There’s a decent level of standard kit available in the Q5, but for much of the clever stuff you’ll need you to delve further into your wallet. SE models get leather upholstery and heated front seats, three-zone air conditioning, keyless entry and a powered tailgate, as well as a DAB radio and Bluetooth. However, sat-nav is an extra expense. In the Sport model, navigation is included, as are upgraded sports seats and some swankier LED interior lighting. Go for S line, and you’ll get privacy glass with some acoustic treatment to reduce cabin noise, leather and Alcantara upholstery with embossed S line logos and some shiny stainless steel pedals. We’d be tempted to add the Comfort and Sound pack, which gives the seats electric adjustment and upgrades the stereo to an excellent Bang and Olufsen system. It’s not cheap, but it’s one of the best available. High beam assist – which automatically dips the headlights from full beam for oncoming traffic – is clever and not too pricey, while adaptive cruise control makes for considerably more relaxed progress on motorways and in traffic. Because you want a compact SUV that conveys a prestige image, and that does a great job in every single area. It’s not the most exciting car of its type to drive, and it’s not the most flamboyantly styled, but it’s an incredibly good all-rounder that’s particularly impressive for interior quality.